While taking inventory of my polish stash (which seriously needs a new storage home) I realized I own a few, ok a couple, ok ok, several shades of mint. I was taking inventory to 1) add in new purchases and 2) try to help my fickle self decide what shade of polish I wanted my next mani to be. Needless to say, coupled with my current amour for all things mint and the numerous shades that sat before me, I was stuck. 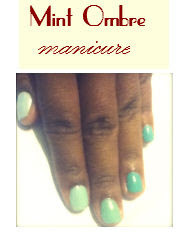 After perusing my favorite beauty and nail blogs I was inspired to do the perfect manicure that fixed my problem: ombre in mint. Problem solved!